Here at Who What Wear, we're big proponents of accessories and jewelry being among the easiest ways to switch up your look. Well, why not let the recent change in season inspire you to change your style? If you're ready to take the plunge, we have the perfect trend for you, and it will be easier to try out than you think. 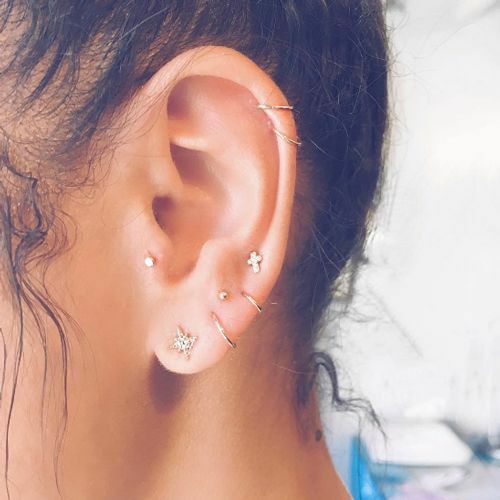 Refinery29 just introduced us to a cool new accessory trend with a name just as interesting: Meet "constellation piercings." You might not have heard the name before, but you've probably seen the style on many a blogger and style setter. Essentially, they're three or more dainty ear piercings clustered together just like stars. While the individual earrings themselves tend to be pretty minimalistic, with thin hoops and tiny studs being the most popular, the look as a whole definitely makes a statement. Plus, there's no one right way to style these piercings. You can go for jewelry as bold or as simple as you like and opt for whichever locations you want as far as lobe versus cartilage. The options are endless! Scroll on to check out some of our favorite constellation piercing snaps for inspiration. Are you loving this trend as much as we are? Shop earrings now to get started!